Special Cable Dispatch to The Sun. 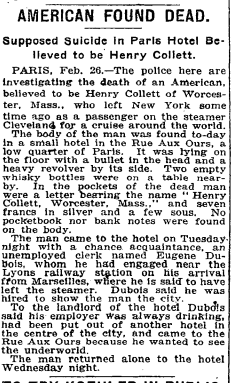 Paris, Feb. 26–Henry Collett, an American ship’s officer, 30 years of age, employed on the Hamburg-American liner Cleveland, was found dead in his room in a hotel here to-day. Death had been caused by a revolver shot. Mr. Collett arrived here from Marseilles on February 22 and hired a room at a cheap hotel for himself and an eighteen-year-old boy named Dubois. Tho man and boy made so much noise at the hotel last night that the landlord ejected Dubois. The latter called at the hotel early this morning and left shortly afterward. At 11:30 o clock Collett was found dead in his room. The police are looking for Dubois. The same day, the New York Times published its own item. It was the same story, but different. Papers would put out morning and evening editions well into the 20th century (I can recall one of the 2 papers published in my hometown running two daily editions in my lifetime). The variation between the Sun’s possibly prurient tale and the Times’s less tawdry but sad story of Mr. Collett’s death being a suicide may have had more to do with when the papers went to press. I’m from the south but live in Worcester and threadbare as the tie was, I was still curious to know whatever else I could about the man who died in that Paris hotel. I couldn’t really satisfy my curiosity the way I wanted, but I did find out a few things about a man named Henry Collett who lived in Worcester at the right time and was the right age. In the 1910 Census, a Henry Collett in the right age range lived at 199 Hope Avenue in Worcester. He lived with the Mallett family and was listed as the head of household’s single brother-in-law. Collett was employed as an operator at a screw factory. He’d been born in Massachusetts, but his parents were French Canadian. Worcester’s population grew a great deal in the 19th and 20th centuries from Canadians crossing the border seeking better jobs. I pass that address on Hope Avenue on a regular basis. It’s along the route to my kid’s school. At the end of Hope a traveler can follow the roundabout to the right and end up on Webster Street. Hope Cemetery is on Webster. Dedicated in 1852, it is the final resting place of luminaries such as poet Elizabeth Bishop the father of rocket science, Robert H. Goddard. Part of me wants to find out if Henry Collett was taken from his shabby hotel room on Rue Aux Ours about 100 years ago and put in the hold of another ship. If he made it back to Worcester, and perhaps to Hope Cemetery. It seems improbable, but you never know. Was it really suicide? A single man in his thirties traveling the world, partying too much with an 18-year-old frenchman… questions there, too. What really happened, Henry, before the war came and erased questions about so many things with gigantic questions we still ask today? If Henry Collett is in Hope Cemetery I have unanswerable questions to ask his headstone.